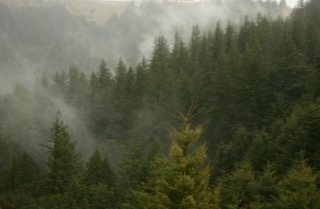 THPBlog: Humboldt Redwood Company to log south of Scotia, CA. Humboldt Redwood Company to log south of Scotia, CA. This THP is about 6 miles south of Scotia, CA and Highway 101 at an elevation of 1,570 to 2,460 feet. Humboldt Redwood Company is planning a tractor and cable logging operation on steep and unstable soils in redwood and Douglas fir forests. The THP area contains 30 landslide terrain sites including multiple debris slide slopes, steep headwall swales, debris flows, rockfalls, fill failures, cut bank failures and disrupted ground. There are also 3 road failure sites including a debris slide near a road, a steep headwall swale near a road crossing, and a road embankment failure. Humboldt Redwood Company is planning to use ground based equipment in areas designated for cable logging. A golden eagle territory is located inside units 1 and 2. More information is available on the THP Tracking Center website.